This 10.9 mile section of the Appalachian Trail in Pennsylvania features Pine Grove Furnace State Park, the Appalachian Trail Museum and the views from Pole Steeple. There is one shelter available along this stretch of trail. The Tagg Run Shelter aka James Fry Shelter was built in 1998, sleeps nine with a composting privy nearby. This section of trail begins at PA 233 (traveling northbound) and the trail follows the road briefly before turning right onto Bendersville Lane, passing Ironmaster's Mansion American Youth Hostel. 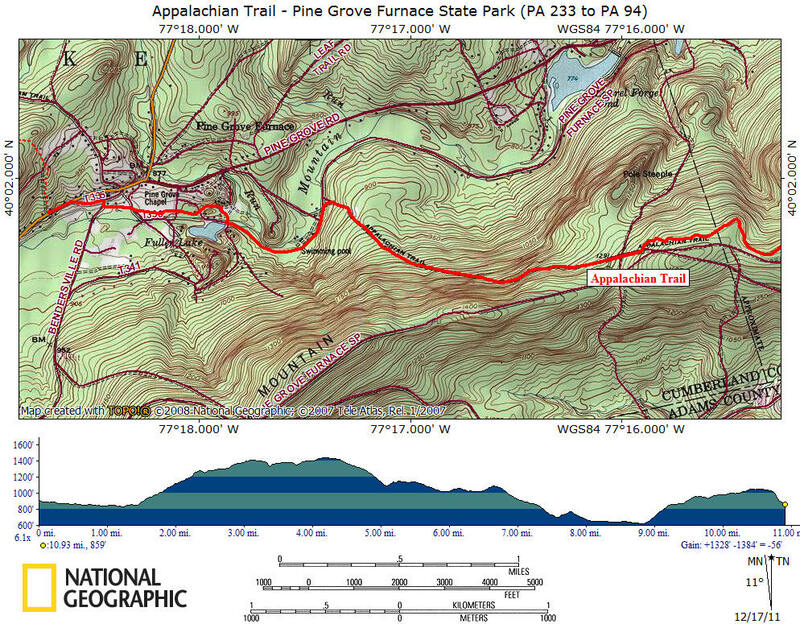 At 0.3 miles the trail enters the 696 acre Pine Grove Furnace State Park. After a long history that began in 1764, the 17,000 acre Pine Grove Ironworks was sold to the Commonwealth of Pennsylvania in 1913. 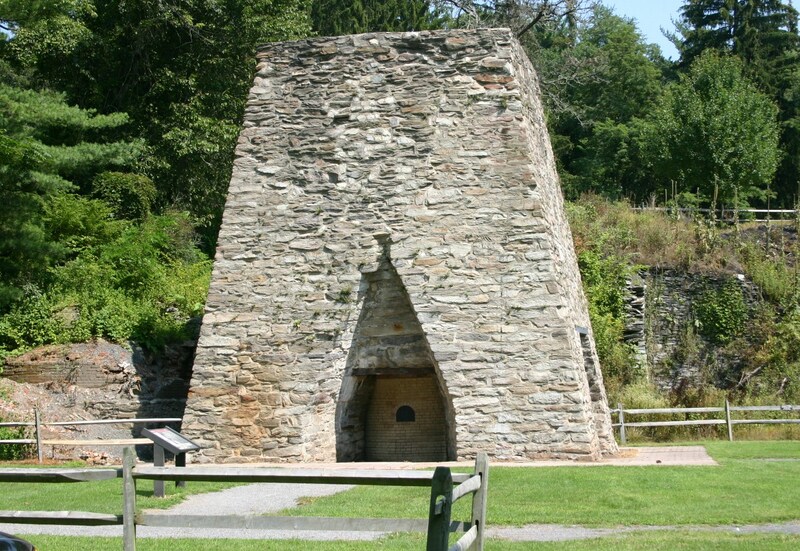 Much of the property was used to create Michaux State Forest and part became Pine Grove Furnace State Park. In 1933, the Civilian Conservation Corps (CCC) established Camp S-51. The CCC built roads, trails and facilities until 1941 in the park. At 0.4 miles the trail passes by a locked gate along an old railroad bed passing Fuller Lake on the right. The lake was once an iron ore quarry, filled with groundwater when the mining ended and became a popular swimming area in the state park. At 0.8 miles cross a footbridge, turn and then cross another foot bridge. At 1.4 miles turn right onto an old mountain road. 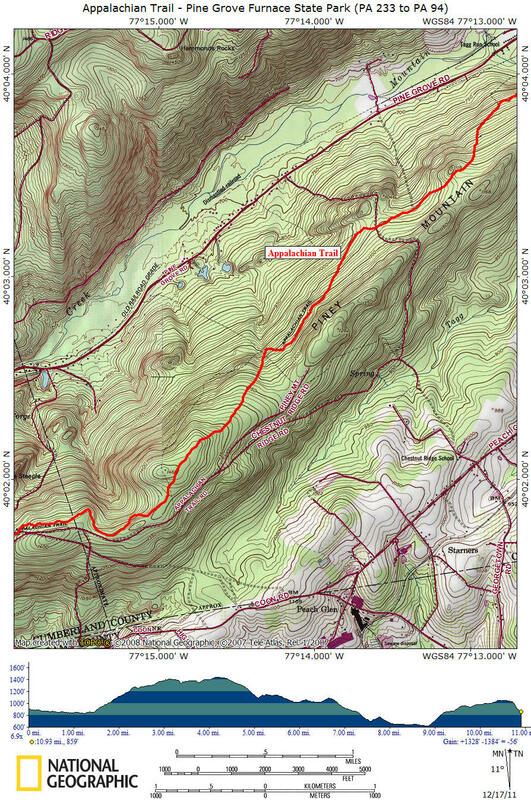 At 2.9 miles reach Old Forge Road and the blue blazed trail that travels 0.5 miles to Pole Steeple, a popular day hiker destination along the Appalachian Trail in Pennsylvania. At 5.0 miles the Appalachian Trail turns right. At 6.0 miles cross Limekiln Road. At 7.7 miles cross Tagg Run. A blue blazed trail on the right leads 0.2 miles to the Tagg Run Shelter. At 8.0 miles cross Hunters Run Road. At 9.1 miles the trail reaches PA 34, turns left and crosses a stream on the highway bridge, then turns right. At 10.9 miles reach PA 94 and the end of this section of the trail. Hiking guide with descriptions and maps for the Appalachian Trail as it travels in Pennsylvania. The guide is broken down by 14 sections of the AT. The book comes to you delivered as a pdf file via email. Use the buy now button and we will send you the file via email usually within 24 hours of receiving payment. 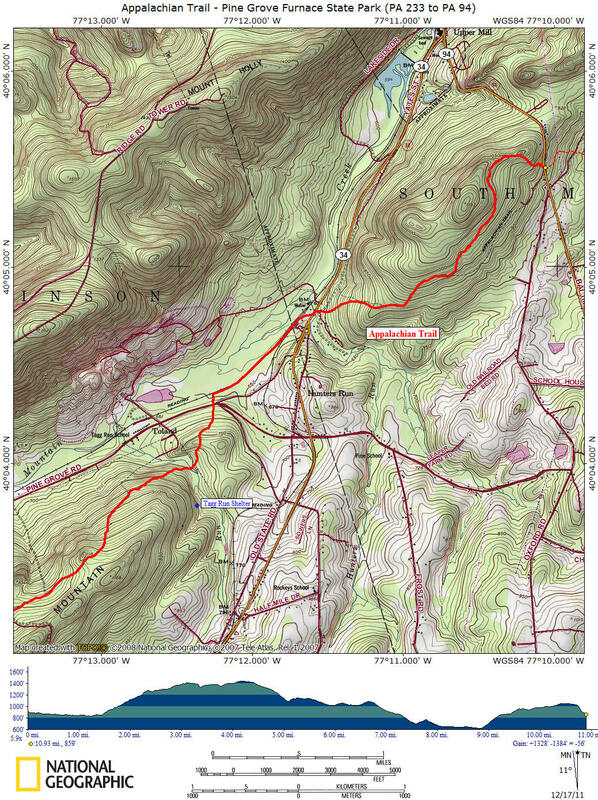 Hiking guide with descriptions and maps for just this section of the Appalachian Trail in Pennsylvania. The guide comes to you delivered as a pdf file via email. Use the buy now button below and we will send you the file via email usually within 24 hours of receiving payment. Happy Hiking!